September 11, 1973 is a fixed point in time in Chilean history whose mention elicits contradictory and often pain filled memories. On this day, the elected government of Salvador Allende was overthrown by members of his military forces led by General Augusto Pinochet. In one way or another, the day marked a turning point for all Chileans. The history of this time period, the two or three years leading up to the coup d’etat and the seventeen years of the military dictatorship are still unresolved and unreconciled in Chilean society. Neighbors, friends, even family members find it difficult to discuss the time period with each other. While in 2015 there is a desire to move forward and celebrate life, the sadness and pain of 1973 has led to a silence between the Chilean people and a deep shadow across the country. 1973: En la Luz is a call to the Chilean people. En la Luz is conceptualized through the light of star 58 Eridani, which is visible in the Chilean sky and lives 43 light years from Earth. This starlight, which was created in 1973, is reflecting on Chile in 2016 and offers us the possibility of seeing 1973 in a metaphoric new light. Over the next year, we are inviting Chileans to gather to share their stories, record short videos and create paper lanterns (for the earth, water or sky) with their memories written on them. Project organizers will collect the videos and lanterns. Each recorded memory will become part of an online installation at www.enlaluz.cl that will serve as a permanent memory bank, for future generations to connect to this period of history through the voices and stories of those who lived it. The paper lanterns will be saved and on September 11, 2016, we will invite the community to join us for a lighting ceremony. Our lanterns, with their written memories, will be set out, set afloat and sent aloft creating a Constellation of Chilean Memory. This lighting ceremony will also serve as the official launch for the project, which will continue through 2016, and on. En la Luz welcomes all Chileans and all personal memories. 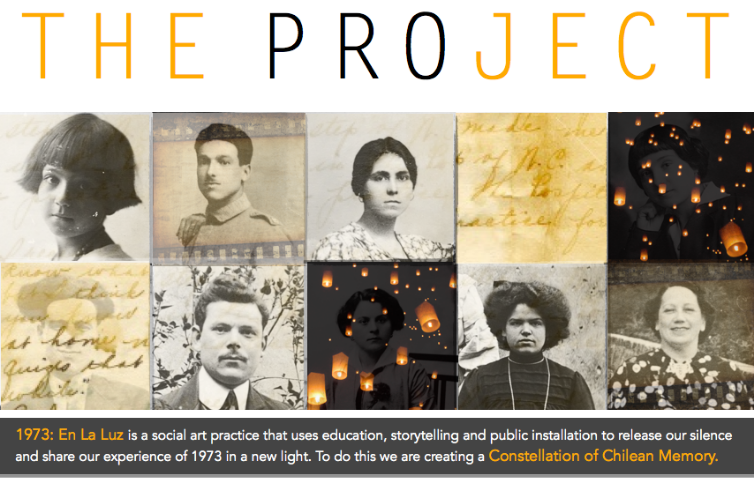 We invite you to contact project organizers for more information about how you can participate in 1973: En la Luz. © EN LA LUZ CHILE. TODOS LOS DERECHOS RESERVADOS.